Police, firefighters and public works personnel in Arlington Heights responded to the November 25-26, 2018 blizzard with speed, organization, and efficiency; but at the top administrative level, the Village of Arlington Heights showed signs of weakness, ignorance, and lack of positive leadership. Village Manager Randall Recklaus was critical of ComEd’s information and communications this week, but he needs to take a good look at his own organization to ensure that residents and businesses in the Village of Arlington Heights are provided with accurate and useful public safety information. In a disaster, residents and business owners need live, urgent information with precise details according to time, location and severity. This is highly important so that residents and business owners in Arlington Heights can immediately activate their own personal emergency plans. Beginning about 7:31 p.m. Sunday November 25, 2018, as the Blizzard of November 2018 unfolded and the volume of incoming 9-1-1 calls increased, the Village of Arlington Heights police, fire and public works departments acquired the most valuable information about hazards, property damage, life safety and injuries via 9-1-1 calls. As 9-1-1 calls were received at the Northwest Central Dispatch System 9-1-1 center, live information was being compiled to organize the immediate responses to emergencies. None of this information was shared to residents by the Village of Arlington Heights — via their website or social media accounts. Arlington Heights officials had the ability to warn residents of an unfolding disaster, but failed. The best public safety-organized communities provide the public with live information off of their 9-1-1 center’s Computer-Aided Dispatch (CAD). The abridged export of CAD data, often including a map of incidents, provides residents and business owners with the necessary information for proper personal response for life safety, and promotes proper civic engagement and awareness of citizens with public safety personnel — primarily police and firefighter/paramedics. Lacking a live CAD notification, responsible municipalities provide live tweets of major incidents with the work of a Public Information Officer (PIO). If residents who need a warm place to stay have any mobility, transportation or other special needs, they are encouraged to call the Village’s Health & Human Services Department at 847.368.5760 for assistance. If calling after 5 p.m. for assistance, please call the Police Desk at 847.368.5300. The failure of Arlington Heights officials to share high priority public safety information amounted to a failure to warn people against potential exposure to specific risks. The failure to inform people also resulted in repeat 9-1-1 calls, and in the duplication and waste of services, equipment, fuel, and public safety labor as emergency units were often dispatched to the same open case emergency over and over again. The failure of information also amounted to a failure to assist people in adjusting a proper response to their own personal emergency plans to prevent property damage, avoid hazards, gain early awareness of the overall scope of the crisis, and understand the best travel routes if travel was absolutely necessary. In the United States, the municipalities with the best public information capabilities have full-time Public Information Officers (PIOs). These personnel usually exist in the ranks of police departments or fire departments or both. Occasionally PIOs are civilian positions. They are accessible to the media 24-hours per day. They post social media messages to residents on social media accounts that are dedicated to emergencies, so the messages aren’t mixed with non-urgent or non-public safety incident information. Instead of releasing important information to the public, the Village of Arlington Heights was silent during the storm, while ComEd’s outage map was beginning to populate incidents. The first tweet from the Village of Arlington Heights account that mentioned the storm was at 10:19 a.m. on November 26, 2018, almost 14 hours after the severe weather began. We look out for you; ComEd is bad. Arlington Heights Village Manager Randall Recklaus — holding on tight to his monopoly of public safety information — controlled the outgoing message to the public, and put blame on ComEd while diverting attention from the lack of public information that should have been supplied to residents and business owners the minute the crisis unfolded. Many frantic, frustrated, uninformed residents bought the village manager’s spin — hook, line and sinker. Two days after the storm, Village Manager Randall Recklaus blamed ComEd for long waits for restoration and what the village called “ineffective communication” by ComEd. Village Manager Randy Recklaus and Assistant Manager Diana Mikula met with ComEd President today regarding ineffective communication and long waits for restoration. The above tweet shows lack of good, positive character because a brief tweet does not verify what is defined as “ineffective communication” by ComEd. The tweet merely puts a childish blame in a chaotic situation, and unnecessary angst in the middle of a crisis. The time for criticism and wailing is in debriefing and assessment after the crisis is over. A leader’s job in a disaster is to present the facts, think outside the box, stay positive and recommend solutions, while developing partnerships with a multitude of solutions providers. What solutions did the Village of Arlington Heights management recommend to residents without power? In the storm’s aftermath, the Village of Arlington Heights recommended that residents without power stay in a motel or with family or friends. Arlington Heights suggested shelter at the Arlington Heights Senior Center that would close at 8:00 p.m., or a visit to the Arlington Heights Memorial Library that would close at 10:00 p.m. No official shelter was established while village officials shifted the message to blaming ComEd. What about elderly residents that still live in single-family residences? Did the village of Arlington Heights remind us to look out for them? Recklaus is on record saying the falling temperatures were getting to be a real safety hazard, but no shelter was established. This last quote shows a lack of objectivity and professionalism in assessing the overall crisis. Judging the ComEd response by comparing a resident’s observation of more Comcast trucks than ComEd trucks shows a complete lack of objectivity by an official. The expectations of the village manager were unreasonable, and showed ignorance of the scope of the crisis and the work required to bring back power to customers. Facing multiple major outages by electric utility crews with hundreds of thousands of customers without power in a blizzard is a formidable task. Repair can’t really begin until the storm is over, since high winds with iced lines can present extra hazards, including electrocution, for utility crews. Lines were whipping or galloping as they call it in the industry. When lines gallop and contact each other, they cause large flashes, and often cause power failures. A galloping line could strike a worker. “Buckets are not allowed to fly” during those storm conditions, meaning that there are safety rules that prohibit the elevated buckets from being raised in such storm conditions. In addition to life safety hazards, assets that have been repaired, could be immediately re-damaged in severe weather. Access to damaged assets is difficult, often requiring snow removal and tree and brush removal. Winter storm repair work has to be done while crews remain cautious of live wires that could be hidden in deep snow and that present the risk of electrocution and death of the crew. Plus the workers must take time to protect themselves from frostbite, cold exposure and hypothermia. Many of the problems with lines that go from the pole to people’s homes were caused by poor management of vegetation in the back of people’s homes. Overgrown trees and bushes brought down many of the service drops, causing multiple power failures to individual customers or households. Recklaus provided a photo op in a conference room in Village Hall instead of showing his recognition of the severity outside on the streets where the crisis was unfolding. The village Facebook post remarked that there were frustrations regarding ineffective communication throughout the duration of the storm. The peak severity of the storm occurred between about 7:30 p.m. Sunday and 4:00 a.m. Monday. During that duration there would not have been significant assessments of damage because the severe weather would have prevented crews from going out to inspect specific areas. There really wouldn’t be that much to communicate yet. The Village of Arlington Heights posted this photo, describing “frustrations regarding ineffective communication throughout the duration of the recent storm, lack of response time and long waits for restoration were conveyed to ComEd. Frustrations regarding ineffective communication throughout the duration of the recent storm, lack of response time and long waits for restoration were conveyed to ComEd. 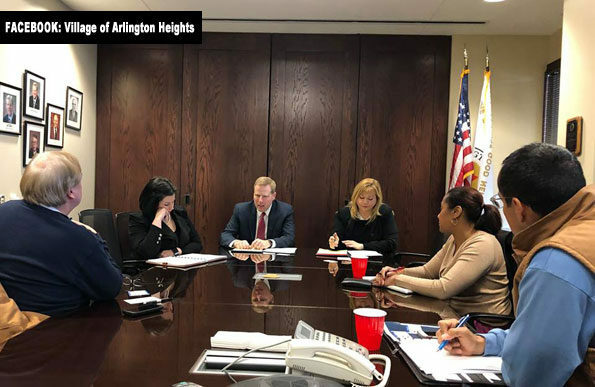 The meeting was a culmination of several Village conversations held with ComEd regarding their response to the snowstorm that hit Arlington Heights this past weekend. Given dropping temperatures and continued uncertainty when power will be restored, the Village advises all residents who are still experiencing a power outage at their home to stay with a relative, friend, or in a hotel this evening. ComEd crews have still been unsuccessful at restoring power for over 5,000 Arlington Heights customers. Arlington Heights has the second highest number of customers affected by the outage in the region, after Chicago. ComEd has been unable to provide estimated restoration times for the customers still experiencing an outage. The Senior Center, 1801 W. Central Road, is open as a warming shelter until 8 p.m. Residents can also drop by the Library, 500 N. Dunton, until 10 p.m.
Fortunately, there were no serious injuries reported from the Blizzard of 2018, but the capability of the Village of Arlington Heights to handle a major disaster is now subject to skepticism. The blizzard was a bad experience, but not nearly as bad as a hurricane or major forest fire. Maybe we’re lax about preparedness, and a little spoiled about having our amenities. More severe, highly unexpected disasters could occur in Arlington Heights. Is our village management prepared to lead positively and manage more severe disasters in Arlington Heights? Who would Randall Recklaus blame then? His role is not to be the most powerful negative whiner in the highest position. He needs to learn his job, roll up his sleeves, engage solutions providers positively, and promote positive civic engagement.